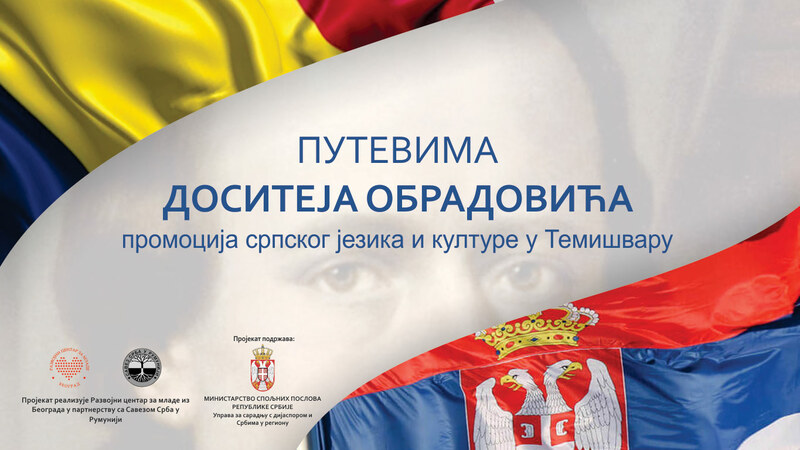 On July 8, 2018, the first one in a series of activities within the project “Following the roads of Dositej Obradovic: promotion of Serbian Language and Culture in Timisoara” will be held – panel discussion “Open on the future of Serbian-Romanian cooperation”. The objective of the panel discussion is to analyze previous and current joint activities, but also to explore opportunities to improve this cooperation, through increasing the scope of youth, sports, cultural exchanges, or through joint preparation of the projects for international donors. Here you will find enclosed the panel discussion agenda. The project “Following the roads of Dositeja Obradovic: promotion of Serbian Language and Culture in Timisoara” is being implemented by Development Center for Youth from Belgrade in partnership with the Federation of Serbs in Romania, and with the support from the Directorate for Cooperation with the Diaspora and Serbs in the region of the Ministry of Foreign Affairs of the Republic of Serbia in the period June-October 2018. Dynamically about the youth activism: why the results are not following undertaken actions?